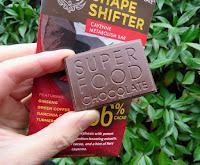 Made for: Ultimate Superfoods, Inc. Welcome to Day #4 of Chocolate and Surprise Theme Week. 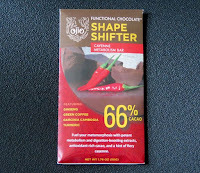 Today's Ojio Shape Shifter Cayenne Metabolism bar from Ultimate Superfoods, Inc. (Moorpark, CA) looked exciting and a little scary. Do I really want to be a shape shifter? In addition to spices like turmeric and cinnamon, this 66% cacao chocolate was powered by some cayenne pepper heat and many other flavor and functional inclusions (ginseng, green coffee, garcinia cambogia, pine bark extract, etc.). Surprise! There was no need to fear. This was a well-tempered bar that broke with a hard snap. And it had well-balanced, rich chocolate and spice flavors. 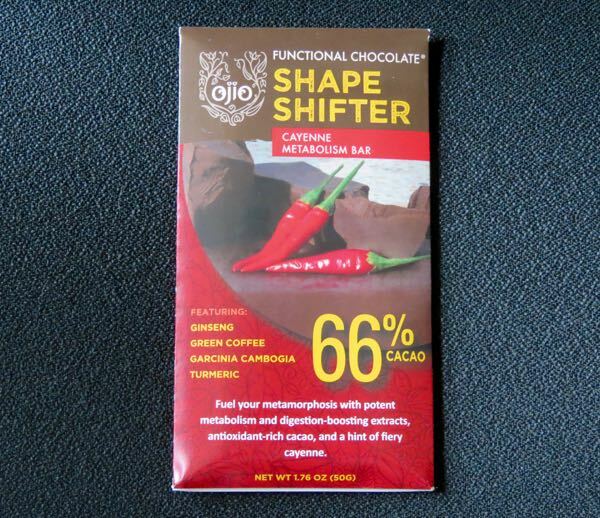 There was no strange medicinal flavor, and this offering did not take the "fun" out of functional chocolate.